Are you an innovative startup that is operating in the industries of FinTech & CyberSecurity? Then Startupbootcamp FinTech & CyberSecurity team invites you to our Office Hours. 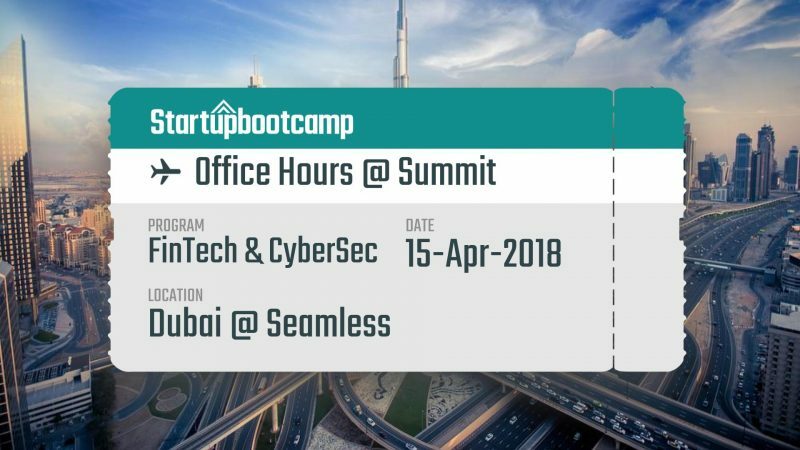 The Startupbootcamp FinTech & CyberSecurity accelerator program, based in Amsterdam, will be in Dubai on the 15th of April to meet and mentor the most ambitious FinTech & CyberSecurity startups. During the Office Hours, you will be able to have an informal meeting with the Startupbootcamp FinTech & CyberSecurity team. Together, we will look at your idea, product, and team, and you will get feedback and answers to your most burning entrepreneurial questions. You will also have a chance to find out more about the Amsterdam-based accelerator program that kicks off in November. After you have submitted your application for the event, we will get back to you to arrange a time to meet on the 15th of April.